Vibrational frequencies and thermodynamic properties at the DFT level are available for molecules (ADF) and periodic systems (BAND). Analytic frequencies are available for GGAs in ADF, and are computed numerically otherwise. IR spectra and vibrations can also be calculated with our semi-empirical software modules DFTB and MOPAC. 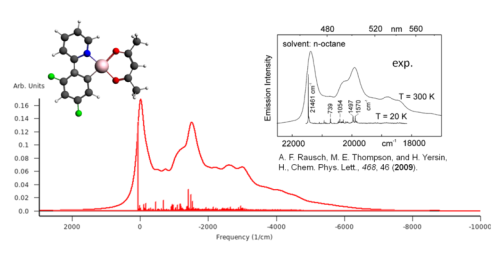 IR spectra and molecular vibrations are conveniently visualized with the integrated graphical interface (see Tutorial). With ADF, static and resonant Raman spectra can also be calculated, as well as vibrational circular dichroism (VCD) and (Resonance) Raman Optical Activity (R)ROA. For the vibrational analysis of a small part of a large systems, the mobile block Hessian (MBH) method can be used, which treats spectator parts as rigid blocks. Overlap between vibrational states of two electronically differing states, Franck-Condon factors (FCFs), can be computed in ADF. Frequencies of excited states can be calculated with TDDFT, so that the vibrational progression of a one-electron excitation may be modeled. Likewise, FCFs yield accompanying vibrational transition probabilities for spin or charge transfer transitions. TDDFTB offers fast excited frequencies (and thereby FCFs) for systems where repulsive parameters are available.